First I have to say that despite the extremely long drive to Hampi on the Thursday night (into Fri. morning), the kids were excellent. Craig tried to sleep through it and Alanna suffered in silence. Once in a while in the last couple hours she would say, "my nerves are getting as thin as cheese wire." Our driver, Balakrishna, didn't complain at all either. Michael and I - well, we may have had a moment or two - but we actually tried to laugh through it at the end. Maybe we were just delirious. Friday morning we had a late start and got under way just before noon. 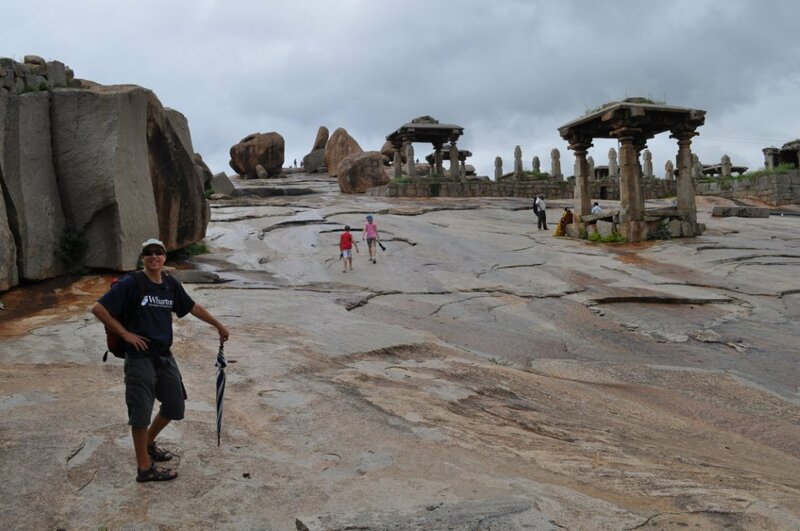 The ancient ruins of Hampi are on the list of UNESCO’s World Heritage sites. The ruins are spread over 25 square km. The topography is straight out of The Flinstones and Bedrock City - huge boulders one on top of another are strewn all over the countryside. We drove to the little hippie town of Hampi bazaar and started by going to Virupaksha Temple which is still used as a religious temple to this day. In fact the kids and I were blessed by the temple elephant, Lakshmi. We took a walk up the rocky and somewhat slippery hill above the temple for some nice views. 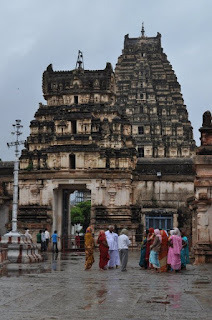 Everywhere you go there are temples. Here we came across a family at an underground temple having a picnic. They insisted on giving us some food and taking photos. 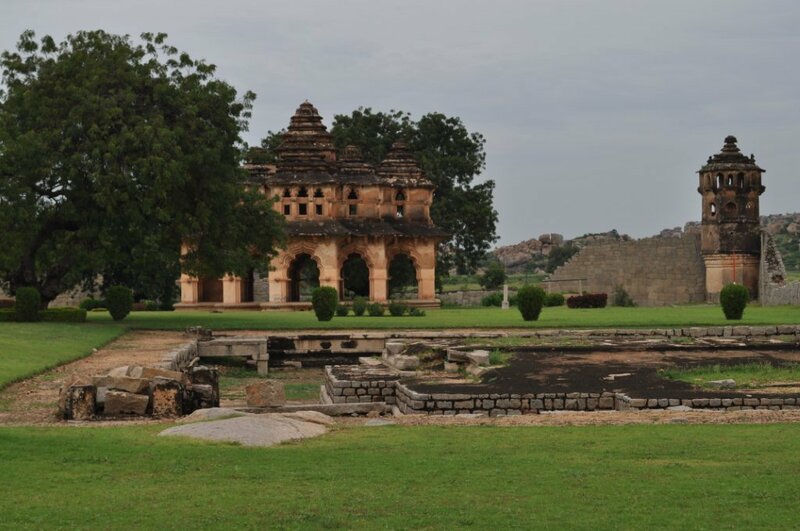 Lotus Mahal is one of the most beautiful buildings and the grounds are clean with lots of trees. It is a great example of Hindu and Islamic architecture.